This article is about the people. For the language, see Aleut language. For other uses, see Aleut (disambiguation). Not to be confused with Alutiiq people. The Aleuts (/əˈljuːt, ˈæl.juːt/; Russian: Алеу́ты Aleúty), who are usually known in the Aleut language by the endonyms Unangan (eastern dialect), Unangas (western dialect), Унаңан (lit. "people", singular is Unangax̂), are the indigenous people of the Aleutian Islands. Both the Aleut people and the islands are divided between the U.S. state of Alaska and the Russian administrative division of Kamchatka Krai. Aleut people speak Unangam Tunuu, the Aleut language, as well as English and Russian in the United States and Russia respectively. An estimated 150 people in the United States and five people in Russia speak Aleut. The language belongs to the Eskimo-Aleut language family and includes three dialects: Eastern Aleut, spoken on the Eastern Aleutian, Shumagin, Fox and Pribilof Islands; Atkan, spoken on Atka and Bering islands; and the now extinct Attuan dialect. The Pribilof Islands boast the highest number of active speakers of Unangam Tunuu. Most of the Native elders speak Aleut, but it is very rare for an everyday person to speak the language fluently. Beginning in 1829, Aleut was written in the Cyrillic script. From 1870, the language has been written in the Latin script. An Aleut dictionary and grammar have been published, and portions of the Bible were translated into Aleut. Sasignan (in Attuan dialect) / Sasxinan (in Eastern dialect) / Sasxinas (in Western dialect) or Near Islanders : in the Near Islands (Attu, Agattu, Semichi). Kasakam Unangangis (in Aleut, lit. «Russian Aleut») or Copper Island Aleut : in the Commander Islands of Russian Federation (Bering, Medny).
? Qax̂un or Rat Islanders : in the Buldir Island and Rat Islands (Kiska, Amchitka, Semisopochnoi). Naahmiĝus or Delarof Islanders : in the Delarof Islands (Amatignak) and Andreanof Islands (Tanaga). Niiĝuĝis or Andreanof Islanders : in the Andreanof Islands (Kanaga, Adak, Atka, Amlia, Seguam). Akuuĝun or Uniiĝun or Islanders of the Four Mountains : in the Islands of Four Mountains (Amukta, Kagamil). Qawalangin or Fox Islanders : in the Fox Islands (Umnak, Samalga, western part of Unalaska). Qigiiĝun or Krenitzen Islanders : in the Krenitzin Islands (eastern part of Unalaska, Akutan, Akun, Tigalda). Qagaan Tayaĝungin or Sanak Islanders : in the Sanak Islands (Unimak, Sanak). Taxtamam Tunuu dialect of Belkofski. Qaĝiiĝun or Shumigan Islanders : in the Shumagin Islands. For specific tribal village names, see List of Alaska Native tribal entities. The Aleut people historically lived throughout the Aleutian Islands, the Shumagin Islands, and the far western part of the Alaska Peninsula, with an estimated population of around 25,000 prior to European contact. In the 1820s, the Russian-American Company administered a large portion of the North Pacific during a Russian-led expansion of the fur trade. They resettled many Aleut families to the Commander Islands (within the Aleutsky District of the Kamchatka Krai in Russia) and to the Pribilof Islands (in Alaska). These continue to have majority-Aleut communities. According to the 2000 Census, 11,941 people identified as being Aleut, while 17,000 identified as having partial Aleut ancestry. Prior to sustained European contact, approximately 25,000 Aleut lived in the archipelago. The Encyclopædia Britannica Online says more than 15,000 people have Aleut ancestry in the early 21st century. The Aleut suffered high fatalities in the 19th and early 20th centuries from Eurasian infectious diseases to which they had no immunity. In addition, the population suffered as their customary lifestyles were disrupted. Russian traders and later Europeans married Aleut women and had families with them. In the 18th century, Russia promyshlenniki traders established settlements on the islands. There was high demand for the furs that the Aleut provided from hunting. In May 1784, local Aleuts revolted on Amchitka against the Russian traders. (The Russians had a small trading post there.) According to what Aleut people said, in an account recorded by Japanese castaways and published in 2004, otters were decreasing year by year. The Russians paid the Aleuts less and less in goods in return for the furs they made. The Japanese learned that the Aleuts felt the situation was at crisis. 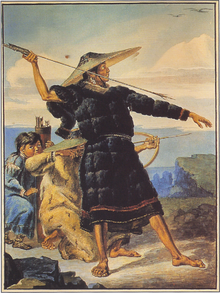 The leading Aleuts negotiated with the Russians, saying they had failed to deliver enough supplies in return for furs. Nezimov, leader of the Russians, ordered two of his men, Stephanov (ステッパノ Suteppano) and Kazhimov (カジモフ Kazimofu) to kill his mistress Oniishin (オニイシン Oniishin), who was the Aleut chief's daughter, because he doubted that Oniishin had tried to dissuade her father and other leaders from pushing for more goods. That evening, hundreds of Aleut men gathered on a mountain and marched to the Russians' houses. When five Russians opened fire, the Aleuts ran away. The next day the Aleut returned, but escaped again when the Russians started firing. While the men attempted another attack the next day, they yelled and moved more quickly towards the house. As Russians opened fire, they started to run away again. After they ran, the Russians noticed that all the men had left the village. The Russians took around 40 women and children hostage, forcing the Aleuts to surrender. The Russians killed four Aleut leaders. In 1942, during World War II, Japanese forces occupied Attu and Kiska Islands in the western Aleutians. They later transported captive Attu Islanders to Hokkaidō, where they were held as prisoners of war in harsh conditions. The United States government evacuated hundreds more Aleuts from the western chain and the Pribilofs during WWII, placing them in internment camps in southeast Alaska, where many died of measles, influenza and other infectious diseases which spread quickly in the overcrowded dormitories. In total, about 75 died in American internment and 19 as a result of Japanese occupation. The Aleut Restitution Act of 1988 was an attempt by Congress to compensate the survivors. On June 17, 2017, the US Government formally apologized for the internment of the Unangan people and their treatment in the camps. The World War II campaign by the United States to retake Attu and Kiska was a significant component of the operations in the American and Pacific theaters. Before major influence from outside, there were approximately 25,000 Aleuts on the archipelago. Foreign diseases, harsh treatment and disruption of aboriginal society soon reduced the population to less than one-tenth this number. The 1910 Census count showed 1,491 Aleuts. In the 2000 Census, 11,941 people identified as being Aleut; nearly 17,000 said Aleuts were among their ancestors. Alaskans generally recognize that intermarriage during the Russian occupation, while the colonists were limited in number, resulted in few full-blooded Aleuts remaining today. Full-blooded Aleuts still exist and are growing in number, and there are also people who may be part Russian or other descent but solely identify as Aleut. The Aleut constructed partially underground houses called barabara. According to Lillie McGarvey, a 20th-century Aleut leader, barabaras keep "occupants dry from the frequent rains, warm at all times, and snugly sheltered from the high winds common to the area". Aleuts traditionally built houses by digging an oblong square pit in the ground, usually 50 by 20 feet (15.2 by 6.1 m) or smaller. The pit was then covered by a roof framed with driftwood, thatched with grass, then covered with earth for insulation. Inside trenches were dug along the sides, with mats placed on top to keep them clean. The bedrooms were at the back of the lodge, opposite the entrance. Several families would stay in one house, with their own designated areas. Rather than fireplaces or bonfires in the middle, lanterns were hung in the house. The Aleut survived by hunting and gathering. 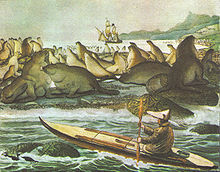 They fished for salmon, crabs, shellfish, and cod, as well as harvesting sea mammals such as seal, walrus, and whales. They processed fish and sea mammals in a variety of ways: dried, smoked, or roasted. Caribou, musk oxen, deer, moose, whale, and other types of game were eaten roasted or preserved for later use. They dried berries. They were also processed as alutiqqutigaq, a mixture of berries, fat, and fish. The boiled skin and blubber of a whale is a delicacy, as is that of walrus. Today, many Aleut continue to eat customary and locally sourced foods but also buy processed foods from Outside, which is expensive in Alaska. A full list of their ethnobotany can be found at http://naeb.brit.org/uses/tribes/5/ (65 documented plant uses). Customary arts of the Aleut include weapon-making, building of baidarkas (special hunting boats), weaving, figurines, clothing, carving, and mask making. Men as well as women often carved ivory and wood. 19th-century craftsmen were famed for their ornate wooden hunting hats, which feature elaborate and colorful designs and may be trimmed with sea lion whiskers, feathers, and walrus ivory. Andrew Gronholdt of the Shumagin Islands has played a vital role in reviving the ancient art of building the chagudax or bentwood hunting visors. Aleut women sewed finely stitched, waterproof parkas from seal gut and wove fine baskets from sea-lyme grass (Elymus mollis). Some Aleut women continue weave ryegrass baskets. Aleut arts are practiced and taught throughout the state of Alaska. As many Aleut have moved out of the islands to other parts of the state, they have taken with them the knowledge of their arts. They have also adopted new materials and methods for their art, including serigraphy, video art, and installation art. Aleut carving, distinct in each region, has attracted traders for centuries, including early Europeans and other Alaska Natives. Historically, carving was a male art and leadership attribute. In today's world it is an art of both sexes. Most commonly the carvings of walrus ivory and driftwood originated as part of making hunting weapons. Sculptural carvings depict local animals, such as seals and whales. Aleut sculptors also have carved human figures. The Aleut also carve walrus ivory for other uses, such as jewelry and sewing needles. Jewelry is made with designs specific to the region of each people. Each clan would have a specific style to signify their origin. Jewelry ornaments were made for piercing lips (labrum), nose, and ears, as well as for necklaces. Each woman had her own sewing needles, which she made, and that often had detailed end of animal heads. The main Aleut method of basketry was false embroidery (overlay). Strands of grasses or reeds were overlaid upon the basic weaving surface, to obtain a plastic effect. Basketry was an art reserved for women. Early Aleut women created baskets and woven mats of exceptional technical quality, using only their thumbnail, grown long and then sharpened, as a tool. Today, Aleut weavers continue to produce woven grass pieces of a remarkable cloth-like texture, works of modern art with roots in ancient tradition. Birch bark, puffin feathers, and baleen are also commonly used by the Aleut in basketry. The Aleut term for grass basket is qiigam aygaaxsii. One Aleut leader recognized by the State of Alaska for her work in teaching and reviving Aleut basketry was Anfesia Shapsnikoff. Her life and accomplishments are portrayed in the book Moments Rightly Placed(1998). Masks were created to portray figures of their myths and oral history. The Atka people believed that another people lived in their land before them. They portrayed such ancients in their masks, which show anthropomorphic creatures named in their language. Knut Bergsland says their word means "like those found in caves." Masks were generally carved from wood and were decorated with paints made from berries or other natural products. Feathers were inserted into holes carved out for extra decoration. These masks were used in ceremonies ranging from dances to praises, each with its own meaning and purpose. The tattoos and piercings of the Aleut people demonstrated accomplishments as well as their religious views. They believed their body art would please the spirits of the animals and make any evil go away. The body orifices were believed to be pathways for the entry of evil entities. By piercing their orifices: the nose, the mouth, and ears, they would stop evil entities, khoughkh, from entering their bodies (Osborn, 52). Body art also enhanced their beauty, social status, and spiritual authority. Before the 19th century, piercings and tattoos were very common among the Aleut people, especially among women. Piercings, such as the nose pin, were common among both men and women and were usually performed a few days after birth. The ornament was made of various materials, a piece of bark or bone, or an eagle's feather shaft. From time to time, adult women decorated the nose pins by hanging pieces of amber and coral from strings on it; the semi-precious objects dangled down to their chins. Piercing ears was also very common. The Aleuts pierced holes around the rim of their ears with dentalium shells (tooth shells or tusk shells), bone, feathers, dried bird wings or skulls and/or amber. Materials associated with birds were important, as birds were considered to defend animals in the spirit world. A male would wear sea lion whiskers in his ears as a trophy of his expertise as a hunter. Worn for decorative reasons, and sometimes to signify social standing, reputation, and the age of the wearer, Aleuts would pierce their lower lips with walrus ivory and wear beads or bones. The individual with the most piercings held the highest respect. Tattooing for women began when they reached physical maturity, after menstruation, at about age 20. Historically, men received their first tattoo after killing their first animal, an important rite of passage. Sometimes tattoos signaled social class. For example, the daughter of a wealthy, famous ancestor or father would work hard at her tattoos to show the accomplishments of that ancestor or father. They would sew, or prick, different designs on the chin, the side of the face, or under the nose. The Russians arrived in the Aleutian Islands in 1786 and were maintained modest trading settlements and religious missions through the mid-19th century. The Aleut people developed in one of the harshest climates in the world, and learned to create and protect warmth. Both men and women wore parkas that extended below the knees. 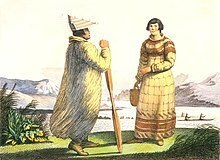 The women wore the skin of seal or sea-otter, and the men wore bird skin parkas, the feathers turned in or out depending on the weather. 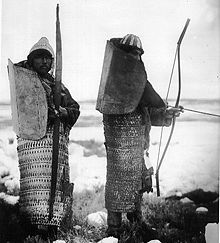 When the men were hunting on the water, they wore waterproof parkas made from seal or sea-lion guts, or the entrails of bear, walrus, or whales. Parkas had a hood that could be cinched, as could the wrist openings, so water could not get in. Men wore breeches made from the esophageal skin of seals. 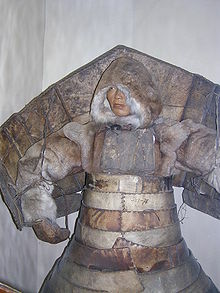 Children wore parkas made of downy eagle skin with tanned bird skin caps. They called these parkas kameikas, meaning raingear in the English language. (Aleut Corp. Web.). Sea-lions, harbor seals, and the sea otters are the most abundant marine mammals. The men brought home the skins and prepared them by soaking them in urine and stretching them. The women undertook the sewing (Enthnohistory: Gross & Khera pg. 32). Preparation of the gut for clothing involved several steps. The prepared intestines were turned inside out. A bone knife was used to remove the muscle tissue and fat from the walls of the intestine. The gut was cut and stretched, and fastened to stakes to dry. It was then cut and sewn to make waterproof parkas, bags, and other receptacles (Turner, Ch. 5, pg. 70). On some hunting trips, the men would take several women with them. They would catch birds and prepare the carcasses and feathers for future use. They caught puffins, Lunda Cirrhata, Fratercula Corniculata, Guillemots, and Cephus & Murres. It took 40 skins of tufted puffin and 60 skins of horned puffin to make one parka. A woman would need a year for all the labor to make one parka. Each lasted two years with proper care. All parkas were decorated with bird feathers, beard bristles of seal and sea-lion, beaks of sea parrots, bird claws, sea otter fur, dyed leather, and caribou hair sewn in the seams. (Gross & Khera, pg. 34). Women made needles from the wingbones of seabirds. They made thread from the sinews of different animals and fish guts. A thin strip of seal intestine could also be used, twisted to form a thread. The women grew their thumbnail extra long and sharpened it. They could split threads to make them as fine as a hair. They used vermilion paint, hematite, the ink bag of the octopus, and the root of a kind of grass or vine to color the threads. Russian travelers making early contact with the Aleut mention traditional tales of two-spirits or third and fourth gender people, known as ayagigux̂ (male-bodied, "man transformed into a woman") and tayagigux̂ (female-bodied, "woman transformed into a man"), but it is unclear whether these tales are about historical individuals or spirits. The interior regions of the rough, mountainous Aleutian Islands provided little in terms of natural resources for the Aleutian people. They collected stones for weapons, tools, stoves or lamps. They collected and dried grasses for their woven baskets. For everything else, the Aleuts had learned to use the fish and mammals they caught and processed to satisfy their needs. In order to hunt sea mammals and to travel between islands, the Aleuts became experts of sailing and navigation. While hunting, they used small watercraft called baidarkas. For regular travel, they used their large baidaras. The baidara was a large, open, walrus-skin-covered boat. Aleut families used it when traveling among the islands. It was also used to transport goods for trade, and warriors took them to battle. The baidarka (small skin boat) was a small boat covered in sea lion skin. It was developed and used for hunting because of its sturdiness and maneuverability. The Aleut baidarka resembles that of a Yup'ik kayak, but it is hydrodynamically sleeker and faster. They made the baidarka for one or two persons only. The deck was made with a sturdy chamber, the sides of the craft were nearly vertical and the bottom was rounded. Most one-man baidarkas were about 16 feet (4.9 m) feet long and 20 inches (51 cm) wide, whereas a two-man was on average about 20 feet (6.1 m) long and 24 inches (61 cm) wide. It was from the baidarka that Aleut men would stand on the water to hunt from the sea. The Aleuts hunted small sea mammals with barbed darts and harpoons slung from throwing boards. These boards gave precision as well as some extra distance to these weapons. Harpoons were also called throwing-arrows when the pointed head fit loosely into the socket of the foreshaft and the head was able to detach from the harpoon when it penetrated an animal, and remain in the wound. There were three main kinds of harpoon that the Aleuts used: a simple harpoon, with a head that kept its original position in the animal after striking, a compound (toggle-head) harpoon in which the head took a horizontal position in the animal after penetration, and the throwing-lance used to kill large animals. The simple Aleut harpoon consisted of four main parts: the wooden shaft, the bone foreshaft, and the bonehead (tip) with barbs pointed backward. The barbed head was loosely fitted into the socket of the foreshaft so that when the animal was stabbed, it pulled the head away from the rest of the harpoon. The sharp barbs penetrated with ease, but could not be pulled out. The bone tip is fastened to a length of braided twine meanwhile; the hunter held the other end of the twine in his hand. The compound harpoon was the most prevalent weapon of the Aleut people. Also known as the toggle-head spear, it was about the same size as the simple harpoon and used to hunt the same animals, however, this harpoon provided a more efficient and lethal weapon. This harpoon separated into four parts. The longest part was the shaft with the thicker stalk closer to the tip of the harpoon. The shaft was fitted into the socket of the fore shaft and a bone ring was then placed over the joint to hold the two pieces together, as well as, protecting the wooden shaft from splitting. Connected to the fore shaft of the harpoon is the toggle head spear tip. This tip was made of two sub shafts that break apart on impact with an animal. The upper sub shaft held the razor stone head and attached to the lower sub shaft with a small braided twine loop. Once the tip penetrates the animal the upper sub head broke off from the rest of the shaft, however, since it was still connected with the braided loop it rotated the head into a horizontal position inside the animal's body so that it could not get away from the hunter. The throwing lance may be distinguished from a harpoon because of the fact that all its pieces are fixed and immovable. A lance was a weapon of war and it was also used to kill large marine animals after it has already been harpooned. The throwing lance usually consisted of three parts: a wooden shaft, a bone ring or belt, and the compound head that was made with a barbed bonehead and a stone tip. The length of the compound head was equivalent to the distance between the planes of a man's chest to his back. The lance would penetrate the chest and pass through the chest cavity and exit from the back. The bone ring was designed to break after impact so that the shaft could be used again for another kill. They buried their dead ancestors near the village. Archeologists have found many different types of burials, dating from a variety of periods, in the Aleutian Islands. The Aleut developed a style of burials that were accommodated to local conditions, and honored the dead. They have had four main types of burials: umqan, cave, above-ground sarcophagi, and burials connected to communal houses. Umqan burials are the most widely known type of mortuary practice found in the Aleutian Islands. The people created burial mounds, that tend to be located on the edge of a bluff. They placed stone and earth over the mound to protect and mark it. Such mounds were first excavated by archeologists in 1972 on Southwestern Unmak Island, and dated to the early contact period. Researchers have found a prevalence of these umqan burials, and concluded it is a regional mortuary practice. It may be considered a pan-Aleutian mortuary practice. Cave burials have been found throughout the Eastern Aleutian Islands. The human remains are buried in shallow graves at the rear of the cave. These caves tend to be located next to middens and near villages. Some grave goods have been found in the caves associated with such burials. For example, a deconstructed boat was found in a burial cave on Kanaga Island. There were no other major finds of grave goods in the vicinity. Throughout the Aleutian Islands, gravesites have been found that are above-ground sarcophagi. These sarcophagi are left exposed, with no attempt to bury the dead in the ground. These burials tend to be isolated and limited to the remains of adult males, which may indicate a specific ritual practice. In the Near Islands, isolated graves have also been found with the remains, and not just the sarcophagus, left exposed on the surface. This way of erecting sarcophagi above ground is not as common as umqan and cave burials, but it is still widespread. Another type of practice has been to bury remains in areas next to the communal houses of the settlement. Human remains are abundant in such sites. They indicate a pattern of burying the dead within the main activity areas of the settlement. These burials consist of small pits adjacent to the houses and scattered around them. In these instances, mass graves are common for women and children. This type of mortuary practice has been mainly found in the Near Islands. In addition to these four main types, other kinds of burials have been found in the Aleutian Islands. These more isolated examples include mummification, private burial houses, abandoned houses, etc. To date, such examples are not considered to be part of a larger, unifying cultural practice. The findings discussed represent only the sites that have been excavated. The variety of mortuary practices mostly did not included the ritual of including extensive grave goods, as has been found in other cultures. The remains so far have been mainly found with other human and faunal remains. The addition of objects to "accompany" the dead is rare. Archaeologists have been trying to dissect the absence of grave goods, but their findings have been ambiguous and do not really help the academic community to understand these practices more. Not much information is known about the ritual parts of burying the dead. Archeologists and anthropologists have not found much evidence related to burial rituals. This lack of ritual evidence could hint at either no ritualized ceremony, or one that has not yet been revealed in the archaeological record. As a result, archaeologists cannot decipher the context to understand exactly why a certain type of burial was used in particular cases. In Snow Crash, a science fiction novel by American writer Neal Stephenson, a central character named Raven is portrayed as an Aleut with incredible toughness and hunting skill. Raven's narrative is one of revenge due in part to perceived mistreatment of the Aleut. "Alaska (novel)" by James A. Michener. ^ "Aleut alone". factfinder.census.gov. US Census Bureau. Retrieved February 20, 2018. ^ a b c "Aleut." Ethnologue. Retrieved 3 Feb 2014. ^ a b "Unangam Tunuu/Aleut," Alaska Native Language Center. ^ a b c "Aleut People". Encyclopædia Britannica. 2011. ^ Corbett, H.D. ; Swibold, S. M (2000). "Endangered people of the Arctic. Struggle to Survive". The Aleuts of the Pribilof Islands, Alaska. Milton M.R. Freeman. ^ "Alaskan People: Aleut Native Tribe". alaskannature.com. ^ "Evacuation and Internment, 1942-1945 - Aleutian World War II National Historic Area (U.S. National Park Service)". www.nps.gov. ^ "The American Indian and Alaska Native Population: 2000 Table 5" (PDF). census.gov. ^ a b c d Black, Lydia (2003). Aleut Art Unangam Aguqaadangin. Anchorage, AK: Aleutian/Pribilof Islands Association. ^ "Kamleika". Google Arts & Culture. Retrieved January 16, 2019. ^ a b Antonson, Joan (1984). Alaska's Heritage. Anchorage: The Alaska Historical Commission. pp. 85–95. ^ a b Durham, Bill (1960). Canoes and Kayaks of Western America. Seattle: Copper Canoe Press. pp. 11–20. ^ a b c d e Jochelson, Waldemar (1925). Archaeological Investigations In The Aleutian Islands. Salt Lake City: University of Utah Press. p. 145. Gross, J. Joseph, Sigrid Khera. Ethnohistory of the Aleuts. Fairbanks: Department of Anthropology University of Alaska, November 4, 1980. Turner, M. Lucien. An Aleutian Ethnography. Ed. L. Raymond Hudson. Fairbanks: University of Alaska Press, 2008. Kevin, Osborn. The Peoples of the Arctic. New York : Chelsea House Publishers, 1990. 52. Print. Krutak, Lars (April 24, 2011). "Tattooing and Piercing Among the Alaskan Aleut" (PDF). Quarterly Journal of the Association of Professional Piercers 44 (2008): 22. Archived from the original (PDF) on September 28, 2011. Lee, Molly, Angela J. Linn, and Chase Hensel. Not Just a Pretty Face: Dolls and Human Figurines in Alaska Native Cultures. Fairbanks, AK: University of Alaska, 2006. Print. Black, Lydia T. Aleut Art: Unangam Aguqaadangin. Anchorage, Alaska: Aleutian/Pribilof Islands Association, 2005. Corbett, Debra G. 2001 Prehistoric Village Organization in the Western Aleutians. In Archaeology of the Aleut Zone of Alaska, edited by D. Dumond, pp. 251–266. University of Oregon Anthropological Papepers, no. 58. University of Oregon, Eugene. Nelson, Willis H., and Frank Barnett. 1955 A Burial Cave on Kanaga Island, Aleutian Islands. American Antiquity 20(4):387-392. Veltre, Douglas W. 2001 Korovinski: Archaeological and Ethnohistorical Investigations of a Pre- and Post-Contact Aleut and Russian Settlement on Atka Island. In Archaeology of the Aleut Zone of Alaska, edited by D. Dumond, pp. 251–266. University of Oregon Anthropological Papers, no. 58. University of Oregon, Eugene. Cook, James. The Voyages of Captain James Cook. Hertfordshire, UK: Wordsworth Editions, 1999. ISBN 978-1-84022-100-8. Jochelson, Waldemar, Bergsland, Knut (Editor) & Dirks, Moses (Editor). Unangam Ungiikangin Kayux Tunusangin = Unangam Uniikangis ama Tunuzangis = Aleut Tales and Narratives. Fairbanks, Alaska: Alaska Native Language Center, University of Alaska, Fairbanks, 1990.ISBN 978-1-55500-036-3. "Aleutian World War II." National Park Service. Wikimedia Commons has media related to Aleut.